After the first 45 minutes or so of build-up gameplay, Gray discovers a device called a "leash" that wires itself into his brain and allows him to grapple and pull objects and foes toward him, then rates his performance in killing them, awarding him points for style. You get skill points for executing bad dudes in grotesque and awesome ways and then you cash in those skill points for weapon upgrades and ammo. Grab a dude with your leash and kick him into a wall of spikes. Cha-ching! Thank you. It's silly and violent and a blast. In playing almost any game, once you reach a certain point, the only fun left to be had is in trying to break it. Shooting badguys in the balls just to see what happens. Trying to push dudes over a cliff. Pushing dudes over a cliff and then shooting them in the balls. Bulletstorm knows this and saves you the trouble of having to get bored before giving up the good stuff. The good stuff is in the game. Hell, it is the game. You can carry three of the game's half-dozen or so guns at any one time, and each gun has a secondary mode. You can also do a significant amount of damage without firing a single shot, just by kicking dudes off ledges, into spikes, into their own friendly fire, kicking their nards and then kicking off their heads to finish them, etc. Among the weapons available are the gun that shoots two grenades attached to each other by a chain and the gun that shoots an exploding harpoon. Both can be used to hilarious effect. Shoot a guy with the Bolo Gun, for example, and the grenades will wrap around whatever part of his body you've aimed at. You can then kick him into a group of his foes before detonating the grenades. For this you will get "homing missile" style points. You will also get to see the effect of your ingenuity in glorious slow-motion, since the game shifts into money shot mode each time you perform a skill kill. The word "gratuitous" comes to mind, but again, if you shut off your brain and let the game take you there it's hard to imagine having more fun. Bulletsorm's single-player campaign takes about 10 hours (including a level in which you must flee from a rampaging robotic dinosaur through an amusement park attraction built to resemble a miniature Tokyo), but with the "Echo" mode, you'll find hours more single-player joy. Echo allows you to play sections of levels over and over until you get it right, accruing more skill points, acquiring stars and besting your online friends in the leaderboard. 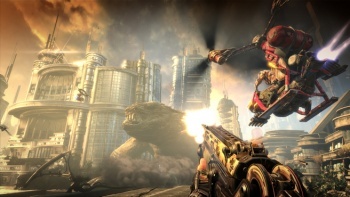 For multi-player, Bulletstorm features "Anarchy" mode, which pits you and your friends against waves of enemies. You can play Anarchy as every man for himself, but you won't get far that way. The trick is to communicate, coordinate and collaborate to pull of team kills. One man kicks a dude in the nuts, the other shoots his head off, etc. When this works, it's a blast, but as anyone who has ever played online will tell you, communication, coordination and collaboration are not very common. You will spend as much time cursing your partners' inability to keep their eyes on the prize as you will feeling the rush of satisfaction that comes from doing it right. This is where having reliable online friends will serve you well. Overall, Bulletstorm seems to do so much with so little that it's hard to imagine where the genre will go next. Except, perhaps, to Bulletstorm 2. The game comes out February 22nd for Xbox 360, PS3 and PC.